To some people, Alexis DeJoria is the wife of “Moster Garage” star Jesse James. To others, she is the daughter of Jean-Paul DeJoria (read my interview with him here, best life story evah), billionaire businessman and co-founder of Paul Mitchell hair products and the Patron Spirits Company. But on the NHRA Mello Yello circuit, Alexis DeJoria is one of the best Funny Car drivers on the tour. 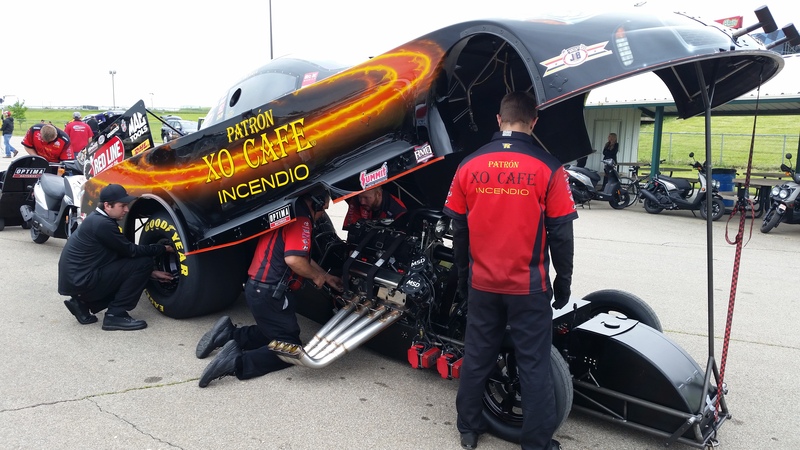 I spent two days with Alexis and her team from Kalitta Motorsports at the Kansas Nationals at Heartland Park in Topeka, and inadvertently found ourselves in the middle of the most exciting weekend in the history of the sport. The day before we arrived, during the second day of qualifying, DeJoria ran the best run of her career, an Elapsed Time (ET) of 3.994. During the weekend, there were a total of 15 three-second runs. There were 19 three-second runs in the entire 2014 season. While ET (the time it takes the car to get from the starting line to finish line) determines qualifying order, it is not as important on race day. On race days, the car that crosses the finish line first wins, regardless of ET. So the quicker car might not be the winning car, because that driver may have left the starting line slower. For any driver, a time in the low fours is considered a successful run. But in Kansas on this weekend, the perfect storm of weather conditions and high performance vehicles combined for the most sub-four runs in one weekend, ever. So what does that even mean? Each run, or “pass” is 1,000 feet. Going a thousand feet in under four seconds means the cars are travelling at speeds in the 300-315 MPH range. Alexis’ car goes from a complete standstill to 100 MPH in less than one second. The gravitational force, or g force, on the body of the driver is 5.4; that’s five g’s, sucka. Conversely, at the end of a run when the parachute is deployed to stop forward motion, the driver and vehicle endure a g-force of 5.4 from the opposite direction, to ultimately stop. Regardless of the fame surrounding her name, noone’s name wins a race – DeJoria has done that for herself. Her three wins in 2014 were the most for a female driver in one season, while capturing two poles, and two track records, and an overall Top Ten finish in the standings. Last year, she made history when she became the first woman to make a sub-four second run. Drag racing is a deliberate sport. Environmental factors like temperature, wind speed, moisture and sea level must all be accounted for at all times. Things the layman would consider inconsequential determine a successful run. The cooler temperatures and lack of sun in Topeka made for an ideal performance on the track for teams and fans. 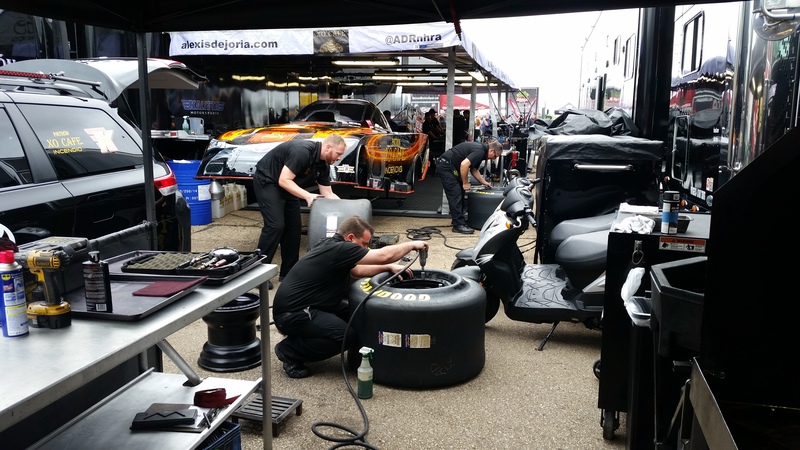 The sights and sounds of pit row at an NHRA event are fully immersive and unrelenting. Unlike NASCAR where a “Hot Pass” is required to access the pits, any NHRA fan with a ticket can hang out and intermingle with their favorite drivers. But the most captivating of all is the smell of nitromethane used for fuel, and its affect on your body. In this video, we captured the Kalitta Motorsports DHL team, anchored by driver Del Worsham, prepping the engine. Nitro is incredibly volatile – it can combust without any air at all. The race itself is a short burst, an explosion of sound and intense speeds. Seeing a car modeled after a jet, travelling over 300 MPH, is entirely captivating – you literally blink and the car is a quarter of the way through its run, 250 feet away from you. 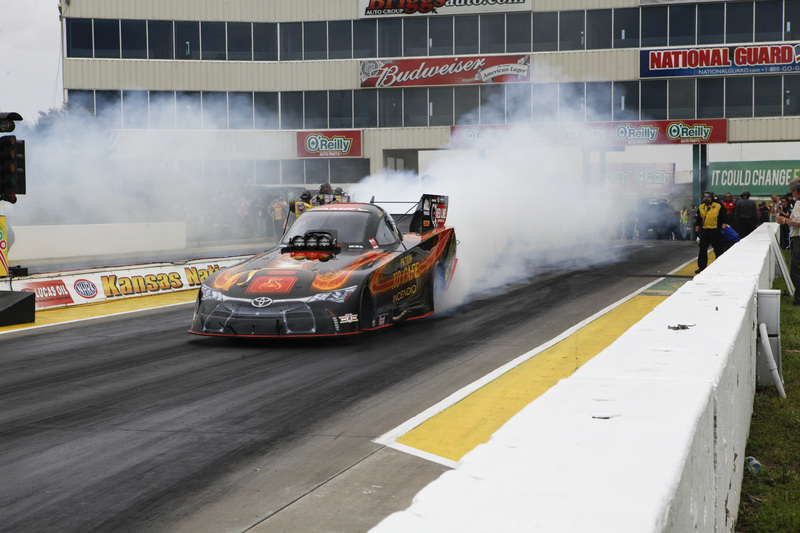 Even though DeJoria’s qualifying time of 3.994 was her personal best, it was just seventh best after two rounds of qualifying. 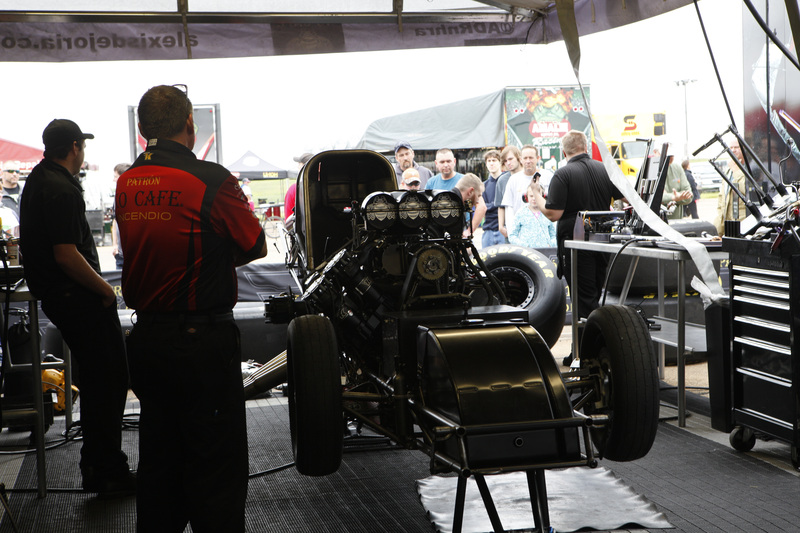 The fastest time in qualifying was 3.967 by Chad Head who earned the number one seed for the elimination round. Though his time only bested Alexis’ by .027 seconds, five other drivers were stacked and slotted within that minuscule amount of time. 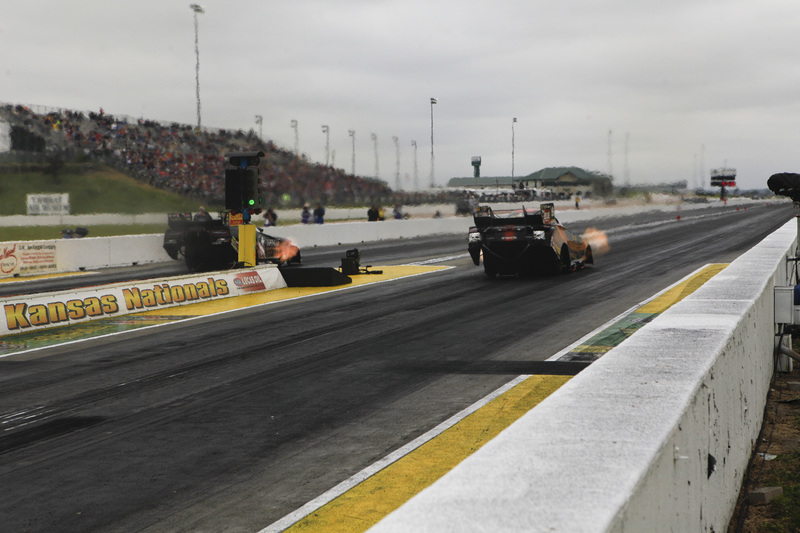 Eventual Kansas Nationals Funny Car winner Jack Beckman set a new record with five three-second runs over the course of the weekend. 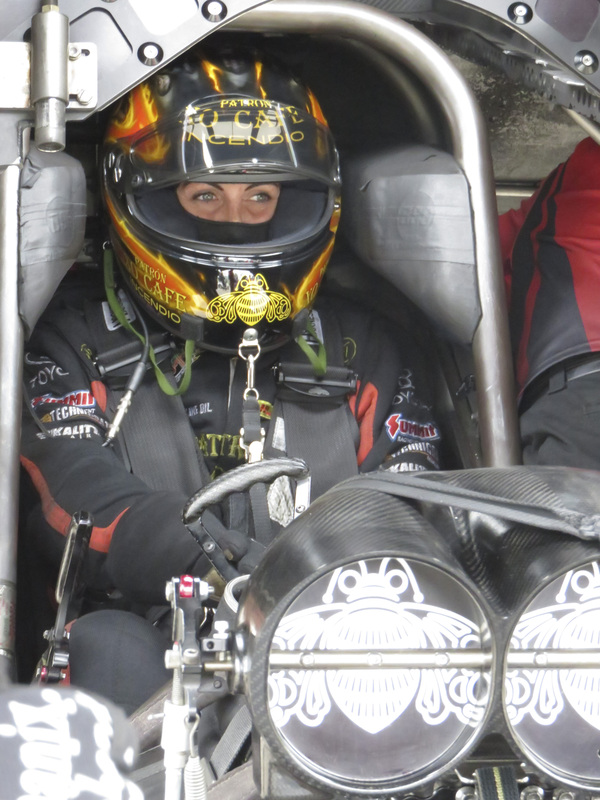 After qualifying and drawing the seventh seed, DeJoria found out her draw for the elimination round the following day was her Kalitta Motorsports teammate Del Worsham, driver of the DHL Funny Car, who secured the 10th seed with an ET of 4.013. With everything on the line the following morning, there was nothing left to do but square off and put the pedal to the medal. Four seconds later, the race was decided. Del Worsham ran the fastest time of his life and Alexis’ day was over. Even after the loss, Alexis is aware of who she is and her place in the sport. Be sure to check out the new Patron XO Cafe and Patron XO Cafe Incendio.